A Croydex Premium Chrome Luxury Curved Rod 2000mm - AD108341 holds the shower curtain away from the user, increasing space and eliminating cling. The 90° return ensures that water is contained in the bath. Can be fitted within opposite walls for a straight run or on adjacent walls for an L-shape configuration. Made from a combination of solid brass and aluminium. Q. Can this be cut down to fit certain length? The Croydex Premium Luxury Curved Rod can be cut to a certain length. Thanks. Q. Please could you advise the minimum length of this product? From the description this appears to be adjustable. 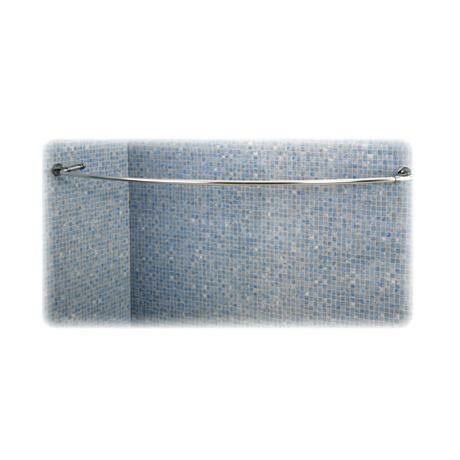 We wanted a rail to go over our bath and this shower curtain rail looks stylish and is perfect fit over a standard bath. We would recommend this product. We had an unusual space to find a rail for. We found that this rail was quite versatile and could be used in many different ways and angles to fit our space. It looks good and is a little bit different to other rails on the market. The delivery of the item was really quick. Very impressed so far. when the product arrived i was abit worried about fitting it myself. but afetr reading the know how it was simple and looks amazing. It was worth the money and also looks amazing in the bathroom after fitting the shower curtain too! So thank you Victorian Plumbing!